Through the Lens is part of International Day of Older Persons celebrations. The competition and exhibition promote active ageing by celebrating the skills of older South Australians through the art of photography and demonstrate that people can learn and create at any age. All South Australian Seniors Card members were invited to enter Through the Lens, the Seniors Card photographic competition. Entries are now closed. More than 1,000 submissions were received! Thank you to all entrants. Eligible photo entries were available to view in an online gallery and members of the public were encouraged to vote for the photo they liked best. The photo with the most votes won the People’s Choice Award. More than 1,700 votes were received. Thank you to everyone who voted! Finalists and winners in each of the six categories were invited to an exclusive event at the City Library in Rundle Mall on 4 October 2018, where winners were announced. Winners and finalists had their work featured in the exhibition for public view throughout October. A photo depicting the strong hypnotic stare of Ellie the owl won the 2018 Seniors Card Through The Lens photographic competition. David Munro was awarded this year’s top prize for his photo taken at the Raptor Domain on Kangaroo Island. View all of the 2018 finalist and winning photos. 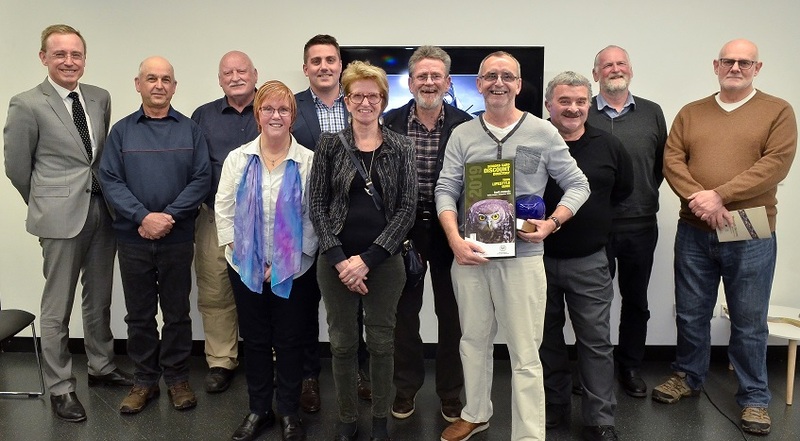 Photo: Finalists and winners of Through the Lens 2018 with Matt Cowdrey MP, Member for Colton and the former Lord Mayor of Adelaide, Martin Haese at the exhibition launch event at the City Library on 4 October 2018. The overall winner of Through the Lens 2018 won a framed print of their winning photograph, thanks to major sponsor Atkins Photo Lab, a $400 photography gift card, courtesy of Diamonds Camera, Video and Digital, a custom-made award thanks to sponsor, Jam Factory and their photo will appear on the cover of the 2019 Seniors Card Discount Directory, Your Lifestyle Guide, available to more than 380,000 people. Two finalists in each of the five categories won a framed print of their photograph, thanks to major sponsor Atkins Photo Lab. The winner of the People's Choice photo won a $100 photography gift card, courtesy of major sponsor, Diamonds Camera, Video and Digital and a framed print of their photograph, thanks to major sponsor Atkins Photo Lab. The winner of the People's Choice Vote (voter) won a DJI Spark Quadcopter Drone valued at $692, courtesy of major sponsor, Diamonds Camera, Video and Digital. Thanks to our launch event sponsor, Claymore Wines. 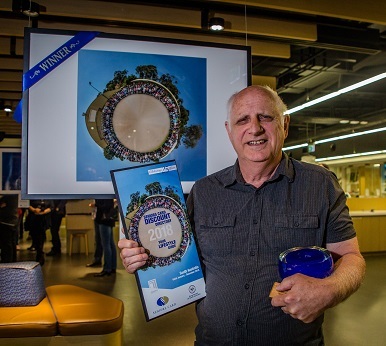 A photo depicting a 360 degree view of participants at a seniors camp was chosen from close to 400 entries as the winner of the 2017 Seniors Card Through The Lens photographic competition. Taken by Grant Hugo at Carrickalinga, the winning photo featured on the cover of the 2018 Seniors Card Discount Directory, Your Lifestyle Guide. The overall 2016 winner was Colin Sanderson for his photo 'Arckaringa Hills at sunrise'. 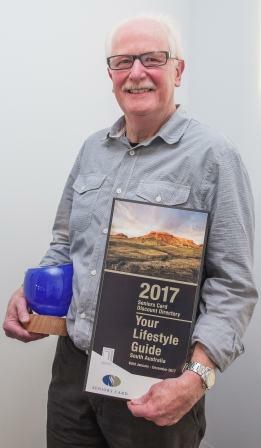 Colin received a custom piece from JamFactory and his photo appeared on the cover of the 2017 Seniors Card Discount Directory, Your Lifestyle Guide.